In the latest release of Silverlight Charts, new features took a backseat to stabilizing our architecture and improving performance. For the intrepid developer the time is right to take the plunge and start experimenting with your own series. 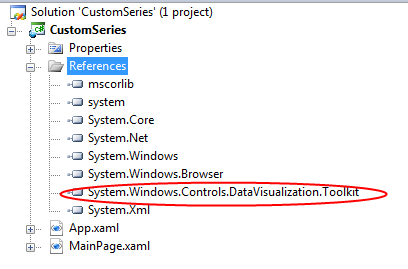 In this series of blog posts I will explain how to implement your own series in Silverlight charts. I will assume you already know how to create Silverlight controls and are familiar with Silverlight/WPF concepts such as the visual tree and templating. If you aren't comfortable with these concepts I advise you to drop by www.silverlight.net and make your way through the excellent tutorials. Let's see if we can implement the stock series using the extensibility points provided by Silverlight Charts. One of the biggest benefits of Silverlight is that control developers can decouple a control's model and its visual appearance. This means that designers can use tools like Expression Blend to give our controls the professional treatment. Finally design-challenged developers can create glassy, beveled controls that impress our clients, friends, and family. Our goal is to take advantage of Silverlight to give the designer as much flexibility as possible to customize our series' appearance. This post explains how to do this. First create a new Silverlight project and import the System.Windows.Controls.DataVisualization.Toolkit.dll from the newest version of the Siverlight Toolkit. Now we're ready to start adding the files we need for our Stock Series. One of the things to keep in mind about Silverlight Charts is that everything is a control. In addition to the Chart control which acts as a container, each individual series and the axes they use are also controls. This is great news for designers because they can completely change the visual appearance of a control by replacing its template. It's also great news for developers because the Control base class provides a variety of useful methods and properties. Our StockSeries inherits from the abstract Series base class, which in turn inherits from Control. The only method we need to implement is the "Refresh" method. When this method is called a series is expected to go back to its data source and render everything from scratch. We'll get to this method later. 2. Add a Default Style for the StockSeries Control. 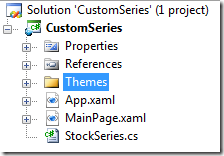 a) Add a folder called "Themes" to the root of the project. 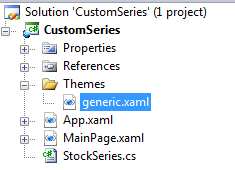 b) Add a new XAML file called "generic.xaml" under the root. 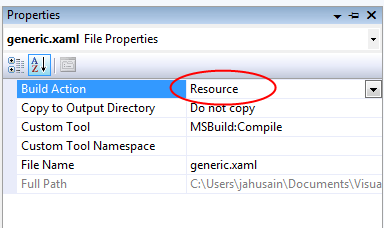 d) Set the build action of "generic.xaml" to "Resource". A control's template contains the objects used to render its visuals. Since a StockSeries plots objects in two dimensional space it makes sense to include a Canvas in its template. The StockSeries will use this canvas to arrange its data points. In order to add a template to our StockSeries control we must add a setter to the default style in the "generic.xaml" file. Now that we've added the canvas to our StockSeries template we will declare that it is a "Template Part" by adding the TemplatePart attribute to the top of our class. A Template Part is an object that must be present for a control to operate properly. The StockSeries can't do very much without a canvas to plot its points in, right? Adding the TemplatePart attribute above to our class is our way of saying "Hey designers! You can replace the template to this class if you want, but make sure to add a Canvas with the name 'PlotArea' in there somewhere." When our template is applied we'll need to retrieve a reference to the our "PlotArea" Canvas object so that we can use it to lay out our data points. We'll store this reference in a private property so that we can use it later. We retrieve a reference to the canvas object when our template is applied so we can be sure that it exists. Now we've created a StockSeries that can be customized by a designer! They can change the background color, add borders, embellish it with images, or whatever. 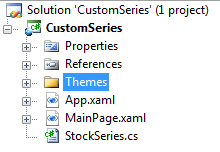 Customizing the template for the StockSeries is nice, but keep in mind that the series is really just a container. The real fun is in customizing the appearance of the data points. In order to give designers this ability we'll create another control for our data points. Now let's add another grid on top and divide in into four columns. This won't do because we need to be able to change the vertical position of the line based on the "Close" value. To accomplish this we nest the line inside of another grid. By setting the vertical alignment of this grid to top and the vertical alignment of the line to bottom we can control the vertical position of the line by adjusting the height of the inner grid. Voila. It's not too pretty but that's not important because a designer can replace it with something really impressive later. 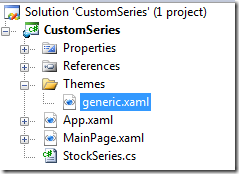 Let's take a look at the default style XAML in "generic.xaml." We expect the StockSeries to size and place the data point such that the top is at the high position and the bottom is at the low position. The series will also set the "CloseCoordinate" property of our StockDataPoint to the correct value when it updates a data point. This will control the vertical position of the line. The "Date" property stores the date on which the data in the data point was collected. This value will be used to determine where the data point appears on the X axis. It is sometimes called the independent value. The "High", "Low", and "Close" values are called dependent values, because they depend on the date on which they are taken. The "CloseCoordinate" property is the vertical coordinate relative to the top of the data point where the line in the data point located. 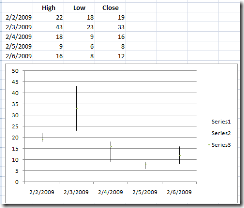 Our StockSeries class will set this value to the location of the Close property as reported by the Y axis. Now we've empowered designers by giving them ability to completely change the appearance of our series and data point controls using Microsoft Expression Blend. If you're lucky enough to have an in-house designer they could even get started right away while you finished implementing the series. 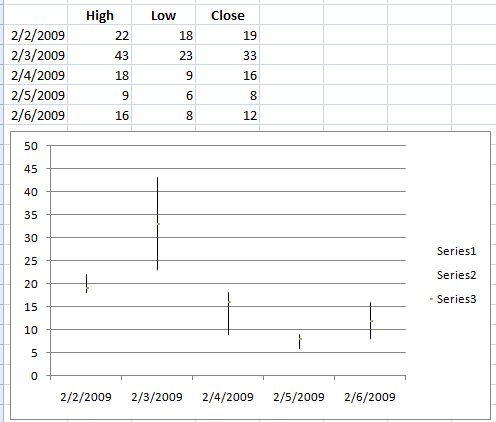 Coming in Part 2: We implement the StockSeries class and starting charting some data! Coming in Part 3: We make our StockSeries dynamic, responding to changes in the underlying data source with smooth animations. The reason I'm seemingly reinventing the wheel here is that the article implements a stock series using classes which are sealed. Customers have to download the source and rebuild. The other reason to write this article is that in this release our axis interfaces have changed quite a bit so that one is somewhat out of date. At the moment the Charting team is not comfortable opening our own DataPointSeries hierarchy. We are concerned that protected members may change in the future and we don't want to lead customers down this path. By contrast we don't expect any changes in the series base class or any major changes in the existing interfaces for axes beyond some new members (maybe). Can this be adapted to support candlestick charts? Please continue posting blogs on charting. Your post on creating chart series is very good. Look forward for more posts on the same lines.